Box: The boxes for the deluxe toys have no windows. I assume this is due to the lack of paint apps (see below). They look kind of awful without the stickers, so leaving out the window will hide that. Good marketing, but it’s only necessary because the toys are so plain without the stickers. Also, the internal packaging is cardboard, and these were very hard to even pull out of the box without damaging the outer boxes. Kit: The kits are fairly easy to assemble, and so far the stickers seem to be staying on well. The plastic is higher quality than the Kabaya kits. They have no paint apps and are perfect for customizers to paint up for a more elaborate look. 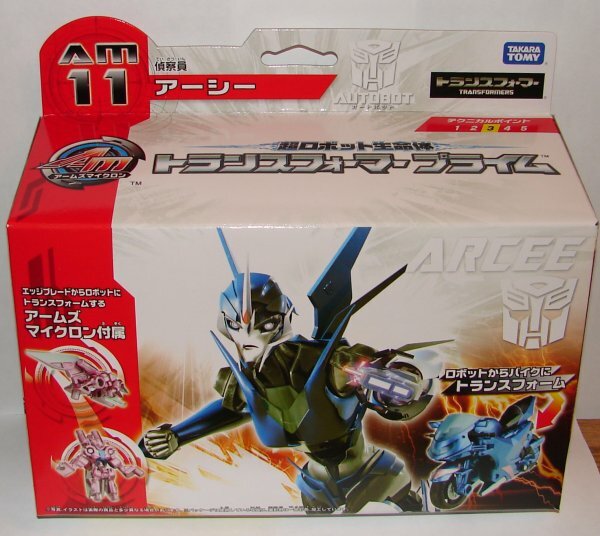 Each Arms Micron includes something like a spark crystal, but I’m not sure if that is the intent of it. A sticker goes on before the outer translucent plastic to form it. They look nice, but I had some problems getting the crystal to stay in on some of them. Might need a little glue. 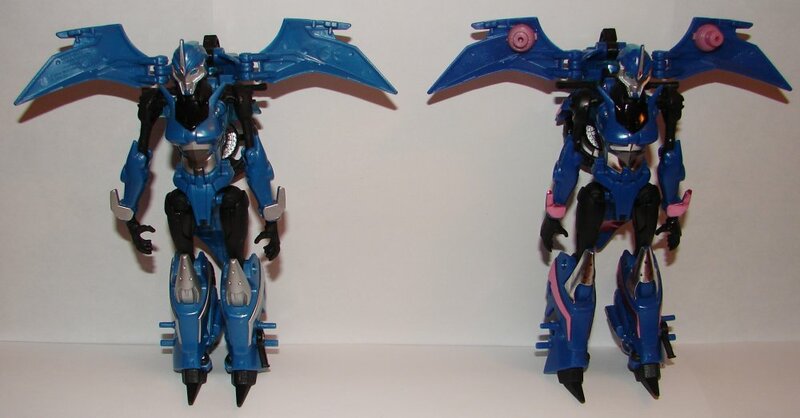 Weapon Mode: Arc is made to look like the weapon that comes with the USA version of Arcee. I don’t like it as much as R.A., the other sword, but it’s nicely done. Could have used a few more stickers. 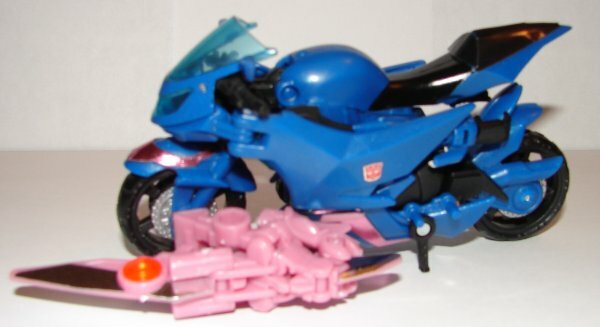 Like the USA version, it can only connect to the side of Arcee’s front wheel in vehicle mode, which I don’t like at all. 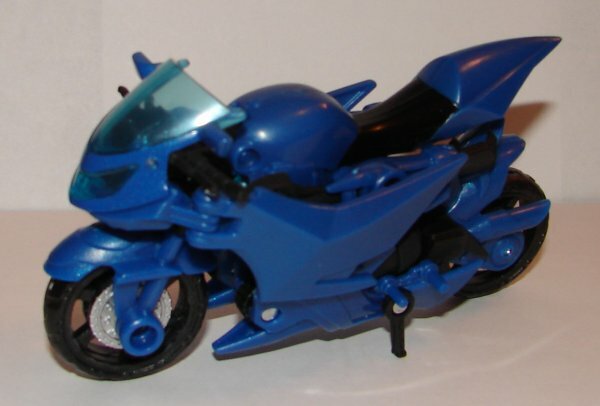 Robot Mode: Arc does not have a great robot mode. It would be better if the arms were able to fold down at her sides. Also could have used some stickers on her arms and legs. 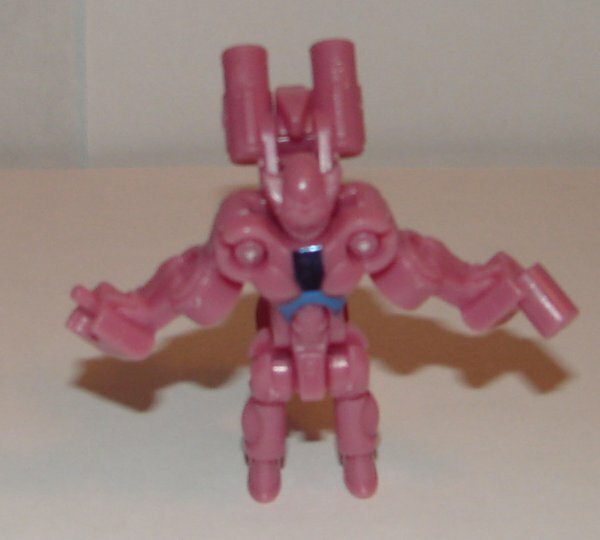 Vehicle Mode: In vehicle mode Arcee has no new Arms Micron ports. The only place to attach weapons, are on either side of the front wheel. They should have put a raised one on the back of the seat. 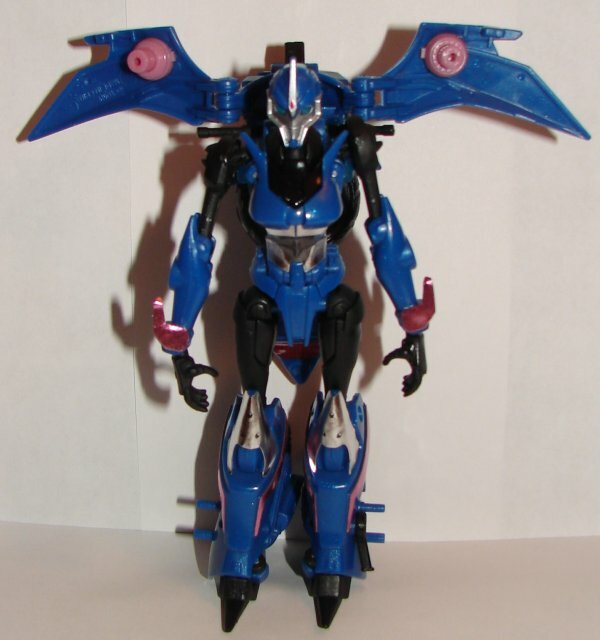 Robot Mode: In robot mode they have added two new Arms Micron pegs (rather than ports) on her “wings”. 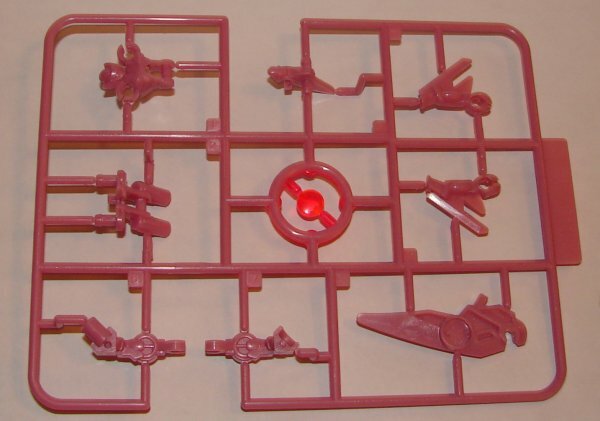 What I find interesting about this change is that, unlike the other toys in the series where they altered the mold (or made a mold with new parts) the new pegs were clearly part of the micron mold as there is no other pink plastic on the toy. It’s impossible to tell how they are connected. Unless they remolded some kind of latch into the door behind the peg (which they very well could have done since all the stamping on the wings is different) then they are just glued on. I’m not going to risk damaging mine to find out, but I wonder if they are just glued on or if they modified the door so it can clip in. If it’s glue, I’m dubious how well they would hold out to being used a lot. Overall: For most of the previous Japanese Prime toys, the weapons have been the only real reasons to get the Japanese versions. 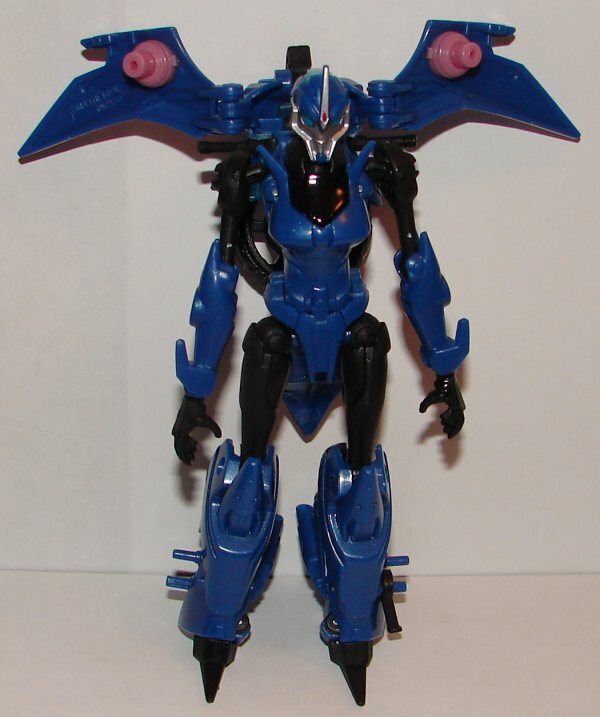 However, the Japanese Arcee is a significantly better toy than the USA version. It’s a darker blue, which looks great. 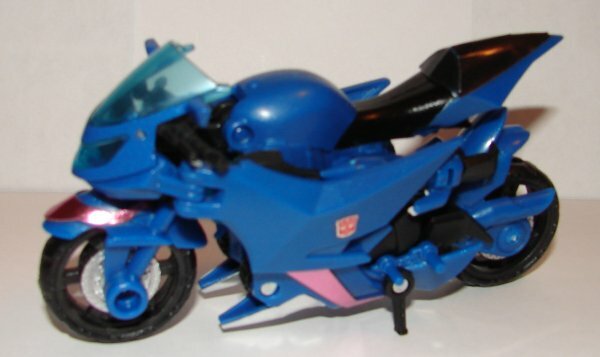 While I do prefer painted details, the pink looks awesome on the blue, while the USA version is all silver details and has no painting on the front fender. Also, I didn’t notice this previously, but on the USA version, the rear view mirrors aren’t painted. They are left translucent blue, and look silly being unpainted. The Japanese one has them painted. 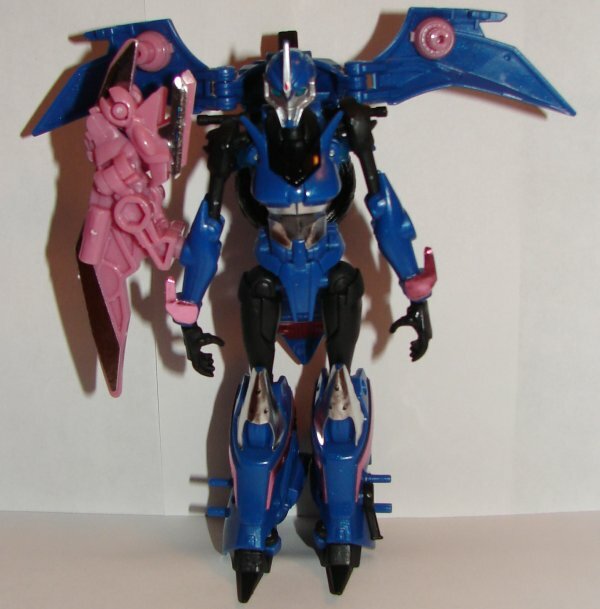 This entry was posted in Toy Reviews, Toys, Transformers and tagged Arc, Arcee, Arms Micron, Toys, Transformers, Transformers: Prime. Bookmark the permalink.